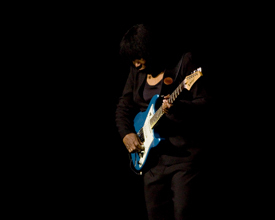 On the lead up to this concert I was staggered at the response I received from work colleagues when I told them that I was going to see Joan Armatrading; every single one of them were under 40 and had no idea who I was talking about; yet for me and the rest of the 1500 capacity audience, she is an absolute legend. In fairness her most commercial years were in the mid to late 1970s, but her songs get played on National radio and….well; it’s their loss. Joan strolled on-stage to a tumultuous reception and before picking up an instrument pretended she couldn’t remember why she was there; her age was to become a running joke and struck a chord with the majority of the audience (although there was a broad demographic from teen to septuagenarians). Picking up a bright blue Variax guitar and suggesting she was going to sing a song from each of her albums; then changed her mind as ‘we would be here until morning’ she then performed City Girl from her debut album Lonely Lady from 1973. While I didn’t recognise it, the song was quite beautiful in its simplicity and very lyric driven; as were the majority of songs which followed. The concert was extremely well balanced with the ‘hits’ interspersed with rarer gems from an assortment of albums; including two from Into The Blues that not only showcased her skills on that electric guitar but proved that ‘this girl not only has the Blues; but she can Rock!’ On the first one, My Baby’s Gone her bottleneck playing was extraordinarily good; sending shivers down my spine. Joan seamlessly slid More Than One Kind of Love into the set early on; and re-interpreted it on the piano much to the audiences delight then followed it with some intricate guitar picking on a 12 string acoustic for All The Way From America. Fans old and new love the singers distinctive voice, but for me I’d completely forgot what a great guitarist she was/is……honestly she totally blew me away several times. Of the songs I didn’t know, In These Times and accompanying video full of iconic photos of world leaders from JFK, to Ghandi to Hitler on the big screen helped focus the mind on the brilliant lyrics. About half way through Joan put down her guitar and spent 5 or 6 minutes talking about her career as photos filled the screen to mark each watermark from her first promo shots through photos by Annie Leibovitz and Lord Linley culminating with her MBE then meeting Nelson Mandela; but she wasn’t finished because she claimed the absolute highlight of her career was when she was featured in a Beano cartoon strip! Revitalised the pace certainly picked up with Steppin’ Out being outstanding; but obviously with a back catalogue like Joan’s it is the ‘hits’ that keeps filling the concert halls, and tonight we got to hear each and everyone, with Joan’s intricate intro to Love and Affection on the 12 string bringing the house down and when it ended the adulation was clearly palpable; yet there was still ore to come. Albeit a solo performance Joan incorporated a loop machine on a few tracks and it managed to give one of the earlier songs Rosie a choppy Reggae lilt, that had the first of the dancers on their feet. This was followed by the highlight of the evening (for me). Drop the Pilot was a joy then it was followed by Me, Myself and I, which was a reasonable hit, back in the day and occasionally turns up on my Mp3 player, but tonight, one woman and an electric guitar managed to make it sound like a cross between The Jam and The Knack – pure Powerpop! As the applause died down Ms Armatrading launched a jokey diatribe against the charade of artists leaving the stage, counting to five then returning for a surprise encore; so the next song would be the real finale (and it was). Joan went to the piano and performed an almost spiritual version of Willow that ended with her tinkling the ivories as several hundred whispered the chorus over and over again. If this really was to be Joan Armatrading’s final World Tour it will be a shame; but after 40+ years on the road she deserves some time back on the farm; and popping out to the shops; but I can’t see her giving up completely; she certainly has too much left to give, so I expect quite a few ‘special shows’ on the horizon.